It was a very special day for some female veterans, who were treated to makeovers by a local beauty school as they transition into civilian life. SHERMAN OAKS, LOS ANGELES (KABC) -- Some female veterans were treated to makeovers by a local beauty school as they start the next phase of their lives. The makeover marked a new look and a new beginning for 11-year Army veteran Laura Kubik. She got out of the Army this year and is transitioning into civilian life, which can be a difficult task. "Going from the military, you felt confident, but it's a different confident. I don't have a weapon anymore," Kubik said. On Monday, about 20 female veterans were treated to the 2nd annual "Color Your Confidence Veterans Day Makeover" event at Paul Mitchell - The School in Sherman Oaks. "Being like a movie star for the day, the attention is here, and it just fills my heart," said veteran Deedee Urueta-Martinez. "One of greatest things any of these fine ladies can have is self-confidence. When you walk into an interview knowing you look OK and you feel OK, you have the advantage of getting that job," said John Paul Jones DeJoria, co-founder of the Paul Mitchell line of hair products. Female vets were treated to free cuts, color and style, makeup tips and manicures - all in an effort to help them feel more empowered and confident to start the next chapter of their lives. 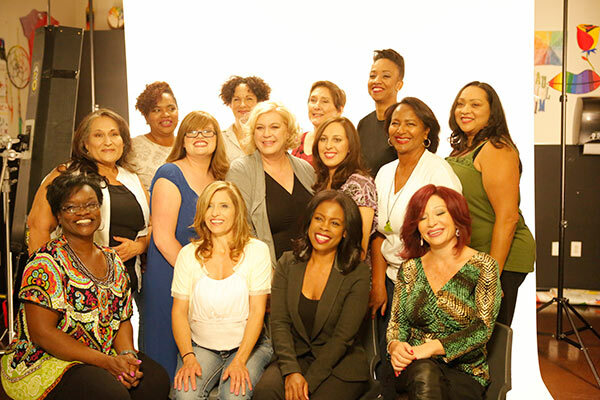 Veterans pose for a group photo after being treated to makeovers at Paul Mitchell - The School in Sherman Oaks on Monday, Nov. 10, 2015. But the program, "Makeovers That Matter" goes beyond just the physical look. "We put together 10 sessions to teach women and give them the tools to re-enter the workforce with more confidence and style, learning how to do a better cover letter, resume, interview skills," said Michael Derricott with Makeovers That Matter. It's a program and a day these women will never forget. "My life has gone through so much that, this is huge to have that little bit of attention on me," Urueta-Martinez said. "I've always gave to my family, friends and whoever needed it. I'm having this for me."